The Finish Line in your Kingdom! | don't bite the apple…work is not a fairy tale! ← Lessons from the King (my dad)! The Finish Line in your Kingdom! What a week in the Kingdom…This week was filled with incredible highs and lows. I felt like a really angry witch and then like Cinderella at the ball. My prince though was the sight of my hard work coming together. Finally! Then I was watching Bob Harper promote his new book and talked about the 80/20 rule. Be strict 80% of the time and you will be ok. The guy he was explaining this to said “8 steps forward 2 steps back and your still 6 steps ahead“. I love that. I always focus on the steps back. I guess I need to do the math. I just finished “The Accidental Athlete”. It’s about becoming an athlete at 43 and never looking back. His focus is on setting goals in running and life and accomplishing them. The part that grabbed me initially was how he set a goal to run three miles. He knew which house he had to get to for that goal. It took him six months to get there. Most people would say he failed at his goal for six months. But he felt every day he got a little closer to his goal. After that accomplishment he started to run 5ks, then marathons, then duathlons and now he’s known worldwide as an expert on running. Did I mention he was overweight, smoked and drank at the beginning of his journey? HUGE obstacles. He talks a lot about setting personal goals and not worrying about beating other people but making himself better. I think that’s why I love to run. My friends laugh when I say “I don’t care about my time. I’m not Kenyan, I’m never going to win.” But I finish and I love it. My first race goal was to cross before they were taking the finish line down. I now have my eyes on a half marathon. I’m beating myself every time I go out there and don’t give up. I work out in my race shirts, it reminds me of all the times I crossed the finish line and I work a little harder. I have a friend that just started running. She had a 5k on her goal board for three years, she checked that off her list last week. Even though it wasn’t a work goal, it was an amazing personal achievement, it spills over. I’ve been applying those principles to work and it’s paying off. You’re reading this right? So is some guy in Australia. My blog finish line was Chicago and it became Israel, Germany and Spain! More importantly, the research, practice and writing are making me better all around. I guess I need bigger goals. Work is like running, you are racing toward your own goals. If you spend your time chasing someone else, you will lose. 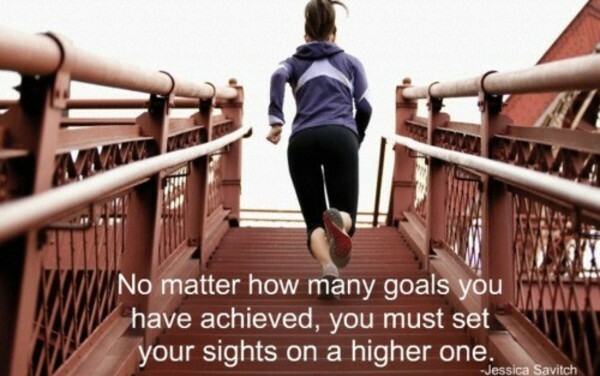 Find your own finish line goal and train. Seek out your weakness and turn it around. Work your mental muscles every day, read and keep up on your industry. Take a rest day, you need time to recover. Celebrate your accomplishments. How many times have you crossed your personal finish line? How do you revisit those victories to keep you motivated? Be careful not to focus on the steps back, but the steps forward. In this day and age, you can’t just sit back and coast. Race to your finish line, do it at your own pace and enjoy the scenery on the way to victory! What are your goals and how are you working to get there? This entry was posted in Uncategorized and tagged goals, human resources, leadership, running. Bookmark the permalink.